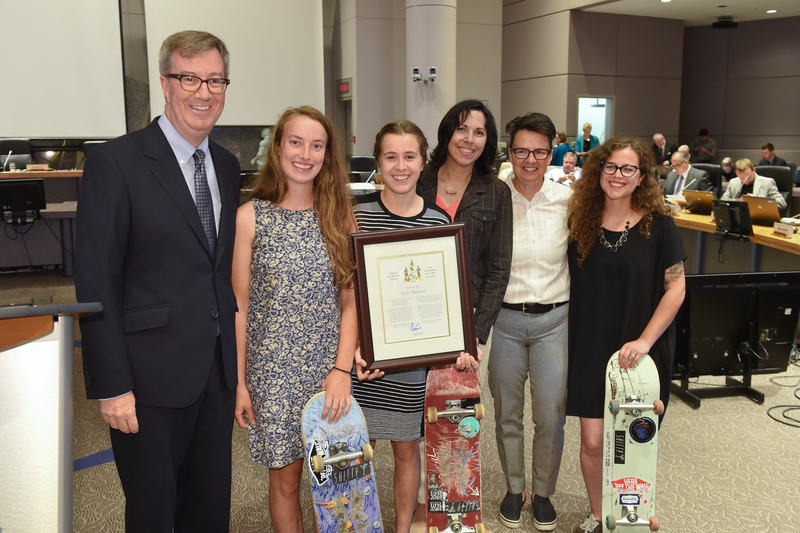 July 13, 2016 – Mayor Jim Watson and Somerset Ward Councillor Catherine McKenney presented the Mayor’s City Builder Award to skateboarding organization Girls+ Skate 613 at today’s City Council meeting. Girls+ Skate 613 builds community, diversity and inclusion by providing a safe space for individuals of all ages, abilities and genders to skateboard in a comfortable, encouraging environment. The organization began as Girls Only Sessions at the McNabb Community Centre in 2006. Girls+ Skate 613 is now a permanent initiative supported by the Ottawa Skateboard Community Association (OSCA), and membership has doubled each year since 2013. Recognizing that girls, women, members of the LGBTQ+ community and other marginalized groups do not have the same opportunities in sports, OSCA and Girls+ Skate 613 are dedicated to empowering individuals who might not have other opportunities to participate in this sport. Girls+ Skate 613 and OSCA work together to support barrier-free skateboarding by providing equipment, facilitating spaces for skating, hosting events, providing resources and education, and fundraising. The Mayor’s City Builder Award is a civic honour created to recognize an individual, group or organization that has, through outstanding volunteerism or exemplary action, demonstrated an extraordinary commitment to making our city a better place today and for the future. This may include lifelong service, outstanding acts of kindness, inspiring charitable work, community building or other exemplary achievements. For additional information, visit ottawa.ca or call 3-1-1 (TTY: 613-580-9656). You can also connect with us through Facebook, Twitter and Instagram. July 13, 2016 – Mayor Jim Watson and Cumberland Ward Councillor Stephen Blais presented City of Ottawa Commendations for Bravery to realtor Geoff Walker and asphalting workers Owen Cole and Alex Deschamps at today’s City Council meeting. The three honorees helped to rescue two men from a house fire on Melette Crescent in the Avalon community of Orléans on June 18. Mr. Walker, Mr. Cole and Mr. Deschamps happened to be driving by when they heard a dog barking and saw smoke coming from a townhouse. Mr. Walker broke a window and they entered to look for people inside who might be incapacitated. They found and evacuated two men, one of whom was unconscious. The fire destroyed four of the six homes in a row of townhouses and significantly damaged the other two, as well as another house behind the row. At least 20 people were displaced because of the fire.